If you've ever gone camping, you know it's a lot of fun...but not for very long. I once went camping for three months when I took a trip around the United States. I had a truck and a tent, and I'd set it up every night. You know, honestly, I had fun, but I'm over it. After a few days you start longing for things like a shower, walls, a real bed. It's a temporary situation. In 2 Corinthians 5:1-8, Paul compares our physical bodies to a tent. "For we know that if our earthly house, this tent, is destroyed, we have a building from God, a house not made with hands, eternal in the heavens" (v. 1). When we leave earth as Christians, we go to heaven. When we move from this tent, this physical body, we go to a permanent temple, a house. Paul was a tentmaker, and his analogy was simple. In the Middle East there are nomadic peoples who live in tents. They pitch their tent for a while and then move on to somewhere else. So, the analogy in this passage is clear. One is temporary (the tent), one is permanent (the house, the building). One is flimsy, one is sturdy. One is weak, one is strong. Your body is like a tent, it's temporary. After a while the threads start to unravel, the flaps become more prominent, it starts to leak. It's just the nature of this temporary body. 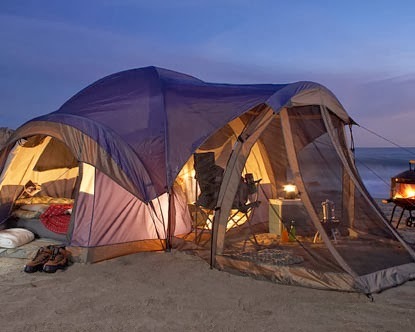 It's interesting how some people want to make their tent look like it's a brand-new model, younger than it really is. So they'll stretch the flaps, and nip and tuck, and dye the threads. But it's only temporary. James goes a step further and says, "For what is your life? It is even a vapor that appears for a little time and then vanishes away" (James 4:14). Our bodies are not meant to last. The tent will be taken down. In the last letter Paul ever wrote, he said, "The time of my departure is at hand" (2 Timothy 4:6). In the Greek, the word departure means it's time to take down the tent and move on. And we trade in the tent for "a building from God." This is referring not to a mansion in heaven but, in context, the building must be a reference to our glorified, resurrected body. We are sure that's really going to happen because verse 5 says, "He who has prepared us for this very thing is God, who also has given us the Spirit as a guarantee." The word guarantee could be translated down payment or first installment. If you give a down payment, it means you're going to pay the rest off. Or if you give your girl an engagement ring, it means there's going to be a wedding. And we've been given the Holy Spirit, who lives inside of us. You've noticed that you've changed since you gave your life to Christ. You have new desires, new hopes—the hope of heaven. All of that is a foretaste of what's to come. And, as Paul says in verse 8, we're confident, whether we're in this body or in heaven. Because those are only two places where God's people are—not soul-sleeping somewhere or in purgatory. You're on earth as a believer, and the moment you leave this earth you are in God's presence. We are only camping out here. There'll come a time when the vapor will disappear, when the tent will be taken down for something more permanent. Those who don't know Him will have a body fit to endure everlasting punishment, and those who do know Him will have a body fit to experience and enjoy everlasting heaven. I pray if you don't personally know Jesus, that in this interim we call time, you would make a choice to follow Him. This morning I had to share this from Pastor Skip Heitzig. This is so on point that I believe we can all learn from it. We are all only camping out here and pretty soon it will be time to pack it all up and head home!!! So keep on fishing while there is still light. Pretty soon it will get dark and it will be time to head home. God bless you!! !